Middle East Perspectives by Rick Francona: Iran - should we even consider talking to this regime? Iran - should we even consider talking to this regime? The news from and about Iran continues to reveal just what type of regime is in charge in Tehran. What is more revealing is the almost constant reassurance to these thugs that no matter what they do, they can at any time open a dialog with the Obama Administration. It seems that not a day goes by that we do not hear from a State Department spokesman that the Iranians just have to say the word and this American government is ready to meet with them to discuss the outstanding issues between Iran and the West. Let's take a look at the regime that our government wants to continue to try to "engage." According to a British newspaper, an Iranian front company in Kabul is paying a reward of $1,000 to the Taliban for each American soldier killed in Afghanistan, and $6,000 for each American armored vehicle destroyed. A Taliban member claimed that he had collected more than $77,000 from the Iranian "company" already. That is a lot of American blood on their hands and flies in the face of what U.S. forces commander General David Petraeus describes as "a modicum of support." There's more. Despite four rounds of United Nations sanctions and a host of unilateral sanctions by countries on three continents, Iran continues to defy the world over its nuclear weapons program. I call it it a nuclear weapons program because only an idiot would believe the claims of the Iranian government that they are developing nuclear power for electricity. The UN's International Atomic Energy Agency just issued a report that the country has enriched enough uranium to make two nuclear warheads if it chooses to do so, and is actively thwarting efforts by the watchdog organization to ensure Iran is not building a weapon. Of course, every time the Iranians have agreed to sit down and talk about their nuclear program, that's all they do - agree to continue to talk, and they emerge with yet more time to develop a nuclear weapons capability. Hardly a week goes by that we do not see yet another Iranian press release that it has developed a new weapons system, including a family of ballistic missiles capable of reaching the capital cities of American allies in the region and even parts of Europe. Additional weapons tests are touted to give the impression that any attack on Iran's nuclear facilities will be unsuccessful, and that Iran is capable of threatening international shipping in the Persian Gulf. The fact that over 25 percent of the world's oil must transit the Straits of Hormuz is not lost on the rest of the world. Combined with all of Iran's new weaponry and nuclear weapons potential are the incessant threats to destroy Israel. Senior Iranian political leaders and clerics (and in many cases they are the same) continue to deny the Holocaust and call for the destruction of the Jewish state. Should we reward this type of behavior with negotiations? Our troops are not the only Americans being threatened by the Iranians. What about the three hikers? I have not heard much from the President or his State Department spokesman about these three young Americans being held in an Iranian prison with no access to needed medical care. The State Department mouthpiece is too busy criticizing Arizona's legislature to take up the issue of American citizens being detained by the Iranian regime. These youths have been held for well over a year. You would think that the policy of "engagement" would have yielded something by now, right? Iran's internal actions should be cause for pause when considering "engagement" by the United States. 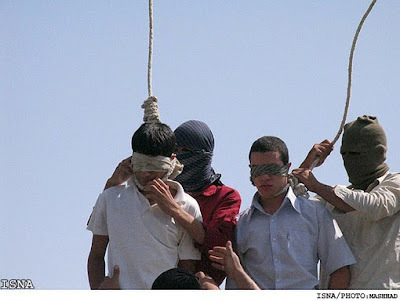 While world leaders call for an end to Iran's continued execution of teens for homosexuality, there is almost no outcry from the American government, nor from the American left. They are quick to label the Tea Party movement as homophobic, yet remain strangely silent about a regime that kills people merely for their sexual orientation. Is this the type of government we want President Obama to sit down and negotiate with? The Iranian regime's action during and after the last presidential elections revealed to the world the type of government that is in power in Tehran. Repression and torture of dissidents were widely reported. The world is currently denouncing Iran for its intent to either stone or lash a woman accused of adultery. European nations have been very vocal against this barbarity - the Obama Administration, not so much. So, Mr. President, in light of all of the above that has happened on your watch, how is that "engagement" policy working out? Have you thought that maybe you are being played for the patsy you appear to be? Bottom line: Not only should we refuse to engage the regime in Tehran, we should be actively supporting its removal.